For international freight rates, 2016 was a year of freight instability. First the bottom dropped out of the spot market. The largest casualty of this, the Hanjin collapse, ﬁnally got prices rising again, rescuing peak season for the remaining ocean carriers. 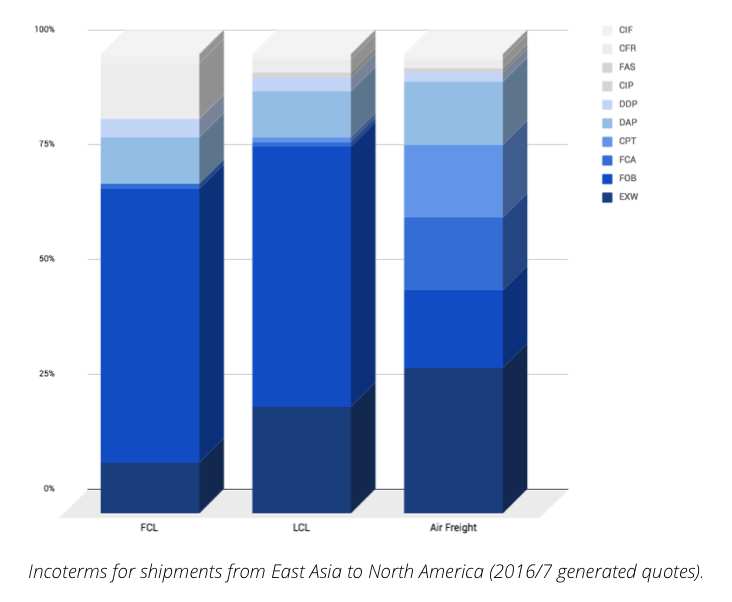 Through most of the year, a lack of transparency saw ocean carriers managing to price discriminate charging some forwarders and shippers a lot more than others. By contrast, 2017 was a relatively stable year for international freight rates. This wasn’t sustainable, market-equilibrium stability though; ocean rates on most lanes actually trended gently downwards through the year even going into peak season. 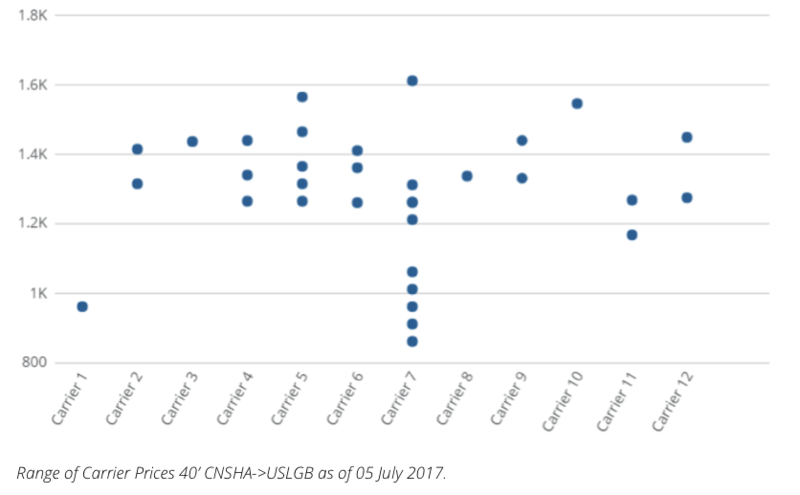 And although the market still lacks transparency, a tighter spread of pricing than the previous year largely protected vulnerable forwarders from adverse exposure. 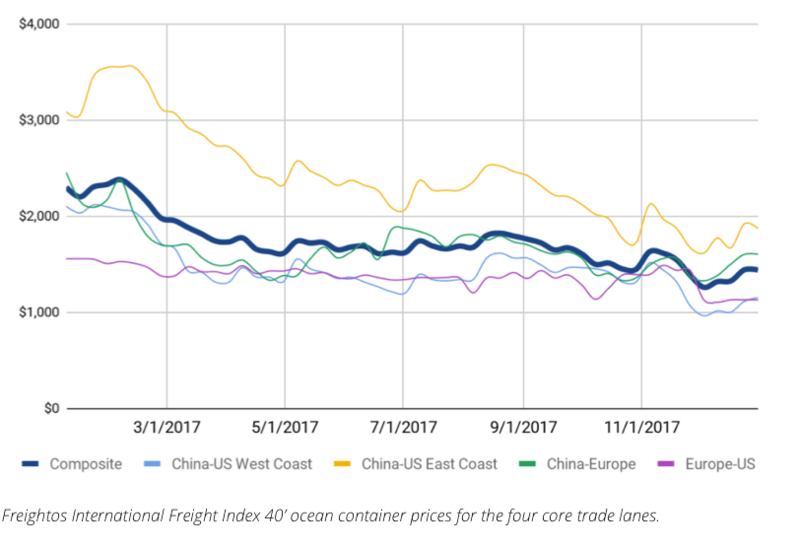 While ocean freight rates continued to drop, averaging a 19% lag behind 2016 rates, modal shifts played a dominant role as more and more shippers opted for air freight. Here’s the full story, as we see it through the prism of data. This report leverages over 750 million price points, provided by Freightos, the online freight marketplace, leveraging data from the Freightos International Freight Index and Freightos Rate Insight. Data usage is, as always, permitted with attribution. For questions, contact press@freightos.com. Chronic oversupply, rather than seasonality, was the main factor driving ocean freight prices in 2017. Supply of container slots will continue to grow unabated in 2018. Despite several carriers pushing back deliveries until next year, the global containership ﬂeet is still expected to grow by 5.6%. With TEU growth exceeding the growth in demand, prices dropped. So, while an early August 2017 uptick raised hopes that peak season was commencing, it couldn’t stem the downward trend. On average, 2017’s peak season lagged 19% behind the previous year. Prices may have been lower, but they were also more stable. Aggregating weekly median pricing on the three China lanes, the standard deviation for 2017 was $351, compared with $414 for the previous year. Opacity and pricing fluidity continues to plague the industry. There was a marked divergence in Shanghai to Long Beach 40’ container pricing across twelve top-20 carriers on this randomly selected day. Prices ranged from $862 up to $1,612, with the highest price almost double that of the lowest price. 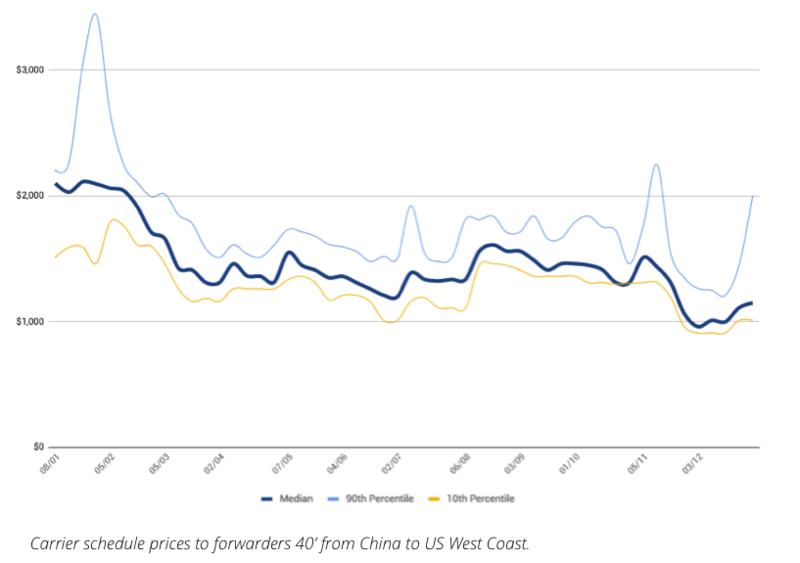 Even after taking carrier 7 (who simultaneously offered both the highest and lowest price to differing forwarders) and a separate outlier of $962 out, the top price is still 34% higher than the lowest, a range of $399. The upshot is that spot market prices for forwarders can diverge radically, and shippers presumably face an even higher variance. This was recently born out in our annual mystery shopping study (results not yet published), where there was a 58% spread of prices from forwarders responding to the same door-door quote request. Freight forwarders without ocean carrier slot guarantee arrangements are exposed to the vagaries of the spot market. But, in 2017 chronic oversupply very much limited that exposure. For all but 13 weeks, the 90th percentile price was less than $500 higher than the median price. The traditional periods when capacity is tight – Chinese New Year, 4th July, Thanksgiving, and Christmas – are clearly identifiable on the above graph. But most of pack are barely affected, as the median price barely changes during these periods. Contrast this to the prices that exposed forwards must accept. For instance, on the week ending 29 January (Chinese New Year week) the median price was $2095, and the 90th percentile price was $1,973 more, almost double the median price. The International Chamber of Commerce recommends only seven incoterms for use with containerized freight, including EXW and FOB. These account for the vast majority East Asia to North America shipment sales agreements. At 32%, EXW is the most common incoterms for air freight, and FOB dominates ocean freight (59% FCL, 56% LCL). As recommended, shippers largely avoided FAS (0% shipments), CFR (4%) and CIF (1%). Despite recommendations to use FCA, FOB shipments still played a large role, accounting for 17% of air freight quotes and 56% of LCL quotes. There has been a growing trend in the ratio of shipments going by air freight instead of LCL. From a 53% share in January 2015, air freight climbed to account for 65% of combined shipments. Shippers are clearly becoming more dependent upon air freight, because there was much less fluctuation to this ratio in 2017 than in the previous two years. These two factors, growth and increased stability, are indicators of the emerging role that e-commerce is playing in freight – both directly and because its brick and mortar competitors are turning toward more responsive supply chains to stay competitive. 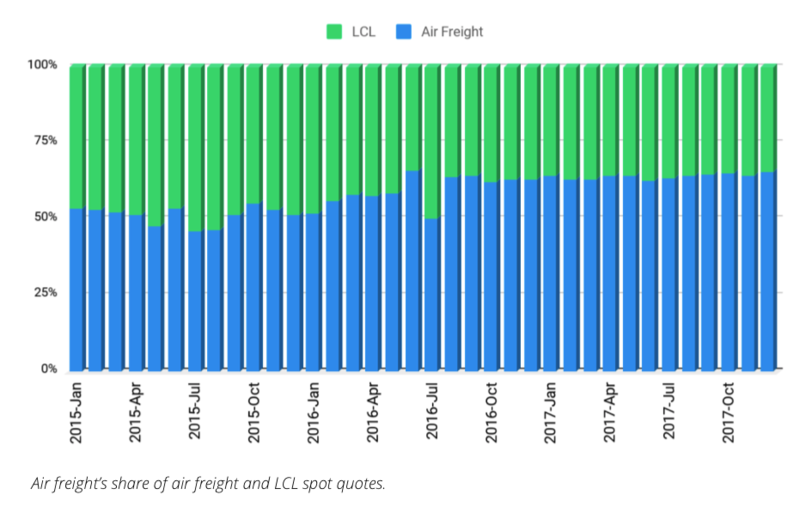 Although more shipments go by air, most cargo still goes by LCL. The average shipment volume for LCL is 18 cbm, whereas air freight is just 1.6 cbm. Get unprecedented freight visibility for free with Freightos Rate Insight.